The pond that started it all in 2009. 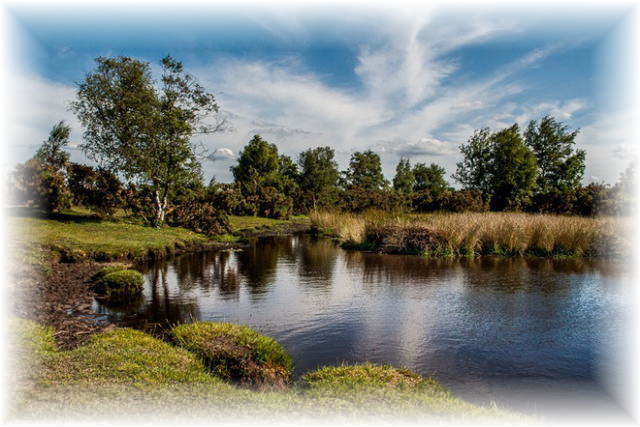 Such unrivalled diversity for one pond, offering a glimpse of the New Forest in one small package. The pond itself is reasonably shallow, accessible and contains a reed-filled island offering a wealth of habitats for the 20 breeding species. Cadnam Common, and the rest of the area making up the 'Bramshaw Commons, are managed by The National Trust and Stagbury Pond is in my opinion the best for dragonfly activity for miles, even when it dries out considerably during long periods without rain. In May the pond is a riot of activity with Downy Emeralds vying for attention among the numerous Broad-bodied and Four-spotted Chasers. Later in the season look for the rare Small Red-eyed or even Scarce Blue-tailed damselflies skimming across the surface and in late summer hawkers patrolling the edges; including the locally-rare Moorland Hawker. The south bank contains an extensive thicket of gorse which is always worth thorough exploration, especially for photographers looking for perched opportunities, although frankly the pond itself is one of the best photographer-friendly ponds to be found in the area. A short walk to the south you will find a bridge over a more extensive boggy area, fed by seepages which are home to a small population of Scarce Blue-tailed damselflies.